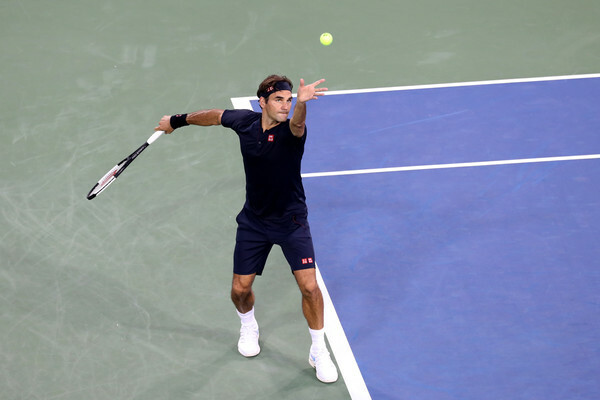 Seven-time champion Roger Federer won his opening match at the Cincinnati Masters in straight sets, saving all five break points he faced against Peter Gojowczyk. His heartbreaking loss at Wimbledon behind him, Roger Federer is off and running in his return to the Western and Southern Open. 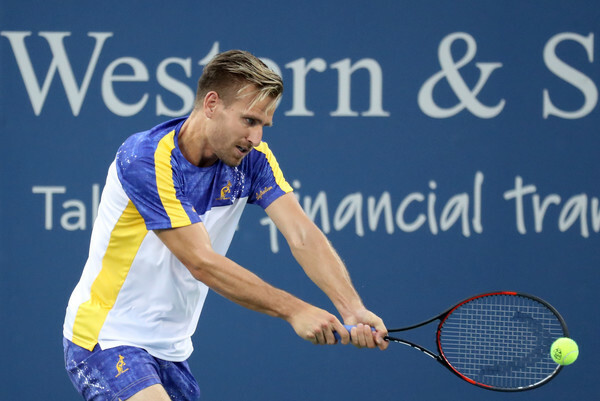 The seven-time champion won his first match in Cincinnati in three years on Tuesday night in straight sets over the hard-hitting Peter Gojowczyk. The last match the Swiss played in Cincinnati was the 2015 final, which he won. After some early jitters, Federer started to find his groove, grabbing a break in each set and hanging on to claim a 6-4, 6-4 victory in just over an hour. Contesting his first match in just over a month, there were some signs of rust from Federer in the early stages. In his very first service game, he struggled a bit to keep the ball in the court and found himself down 40-AD when Gojowczyk cut loose on a forehand that the Swiss could not handle. The German sent his return long but got a second chance when Federer double-faulted. This time, the Swiss served his way entirely out of the jam with three straight unreturned serves. Federer would start to turn the match in the next game thanks to a bit of luck. On game point, a shot from the Swiss clipped the net cord and sat up for Gojowczyk to put away and take the game, only to dump it into the net. The German then netted a forehand to give Federer a break point, but he used his giant forehand to draw an error and erase the threat. Two games later, Gojowczyk sent a forehand into the net to go down 15-40. Federer sent his forehand long on the first break point, but the German sent a backhand wide on the second to give the break to his opponent. Some of the rust was still showing in Federer’s game as he double faulted at 4-3, 15-30 to go down double break point, but he managed to rally to save both as well as a third at 40-AD. When it came time to serve for the set at 5-4, the Swiss held to love. After his sluggish start to the opening set, the world number two came out swinging in the second, although he got a bit of help. After battling to deuce on Gojowczyk’s serve, Federer got a look at a break point courtesy of a double fault from the German. He would grab the immediate break to start the second set as Gojowczyk sent a backhand wide. Consolidating proved a bit tricky for the Swiss, as he let a 40-15 lead slip away in the very next game but managed to hold without allowing a break point. That would be the end of the shakiness for Federer. The Swiss was finding his rhythm, controlling the rallies and defending his serve well. He would not face another serious threat against his serve as he cruised towards the finish line. Federer polished off the victory with a hold to love. After the match, Federer spoke about how Gojowczyk was taking big cuts at the ball. That proved to be more of a curse than a blessing for the German who committed one more unforced error than winner, 22 to 21. Federer, on the other hand, had 24 winners to just 16 unforced errors. Once he settled in, Federer was strong on serve winning 79 percent of his first serve points and striking 12 aces. 47 percent of his serves were not returned in the match and he saved all five break points he faced. Gojowczyk dominated when he got his first serve in, winning 83 percent of those points. However, he missed it 45 percent of the time and only won 38 percent of his second serve points. Federer will meet Leonardo Mayer in the third round.